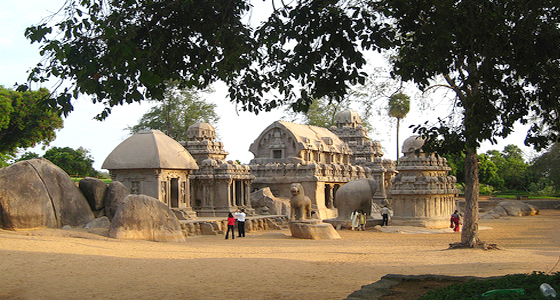 Mahabalipuram, also known as Mamallapuram is a town in Kancheepuram district in the Indian state of Tamil Nadu. It is around 60 km south from the city of Chennai. The former name of this place 'Mahabalipuram' has a history, a very rude cruel king Mahabali reined this place and in a fierce battle king Mahabali was killed by Lord Vishnu and the place was named after the dead, arrogant kind Mahabali. 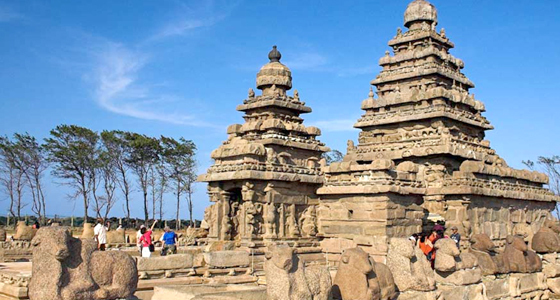 The beauty of Mahabalipuram is a combination of architecture, vast casuarinas trees & of silvery sandy beaches. 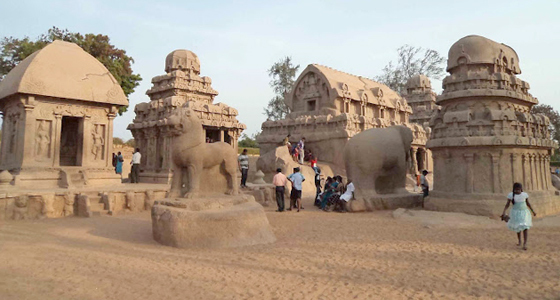 Any visitor who visits mahabalipuram will remain startled and intoxicated with the grandeur. They feel hand hearted and more out from this historical and fascinating tourist spot. Shore Temple: The oldest structure in the area, build c. 700 AD, this temple has been here for more than 1400 years. The area around the temple is now a landscaped park, with guards keeping the hordes of souvenir hawkers at bay. A Shiva lingam is enshrined in the central building and the site can get very crowded on weekends. Five Rathas (Pancha Pandava Rathas): This site contains five Rathas, literally chariots, dating from the 7th century. The sculptures are complemented by some enormous stone animals, including a large elephant. Evening Return back to the hotel. Overnight stay at Mahabalipuram. Thirukadalmallai: This temple dedicated to Lord Vishnu. 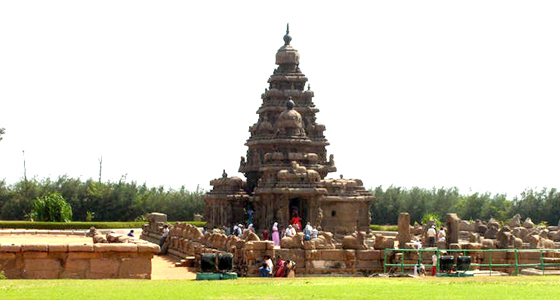 It was also built by Pallava King in order to safeguard the sculptures from the ocean. It is told that after building this temple, the remaining architecture was preserved and was not corroded by sea. Sculpture Museum: East Raja Street has hundreds of sculptures in stone, wood etc. The following structures like Arjuna's Penance, Krishna's Butterball, Mahishamardini Cave. Varaha Cave having four impressive carvings of Vishnu, Gajalakshmi, Trivikrama and Durga are all carved straight out of rock in the central hillside area, so you can travel between them on foot. The scenery within the hills is also quite unusual, with smooth rock rising out of the forest and carved stairways leading between the mandapas (pavilions), caves and carvings. The Old and new light houses provide views across the area to the sea. There are several unfinished temples nearby, and the December 2004 tsunami exposed more previously submerged temples. You also can chill on the sandy beach for relaxation or can enjoy Boat rides in the Bay of Bengal with life guards, fishing trips to the sea & Turtle walk at the sea shore.